Our 2017 Winter Collection is comprised of eleven favourites and one brand-new design, from designers in Australia, New Zealand and the USA. Burwood socks from Brenda Green are pictured in our 4ply sock yarn in the ‘Silver Tussock’ colourway. Suitable for those who would like to try their hand at sock-knitting, Burwood has an engaging stitch pattern that will also suit experienced sock-knitters. With four sizes, Burwood will fit most feet, and White Gum Wool sock yarn is now available in four colourways – two multis and two solid colours. Treat your feet to some White Gum Wool socks and you won’t look back. For those wanting fine mitts to take the frosty edge off, we love Nichole Westin's wonderful Inverto pattern. Knitted in our Gum Grey 4ply yarn, Inverto feature a sweet lace detail and well-proportioned thumb gussets. While it may seem like there could be a lot of purling involved, the genius of Inverto is that they’re knitted inside out! The ultimate light fingerless glove. Our 8ply yarn in the Quarrystone colourway is seen here in a pair of Coop Mitts by Justine Turner. With a textured unisex mesh pattern and sizes to fit most people from teens to burly men, Coop Mitts offer real warmth and look great in light as well as dark colours. Form by Alison McCarney is a modern classic beanie that provides ultimate levels of warmth in our cosy 8ply. Shown here in the new heathered colourway ‘She Oak’, and in ‘Flame’, Form will fit everyone from toddlers to adults. The pompom is optional, of course, but fairly irresistible! Sally Oakley contributes Tea Breeze. A combination of cables and lace decorate this hat, knitted in our 5ply silk/merino. Pictured here in the natural colour, Tea Breeze presents an opportunity to sample one of our eight silk/merino colourways – including six new colours. Melissa Schaschwary has written a wonderful sweater pattern in Key To Comfort. Knitted in the 5ply silk/merino and modelled here in the Hawthorn colourway, Key to Comfort really is the ultimate luxury pullover. And best of all: it knits up fast. No winter collection would be complete without a cowl or two. 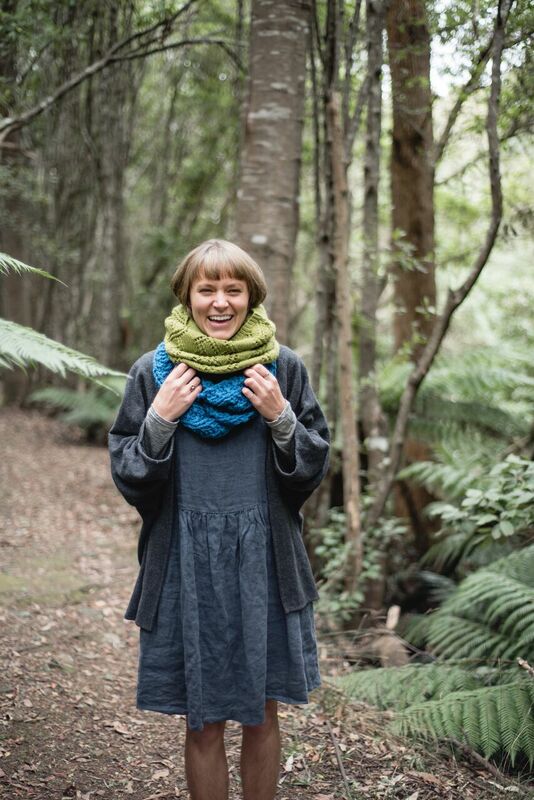 Rebecca Robinson contributes her Boobook Trail cowl, knitted in our plush boucle yarn. 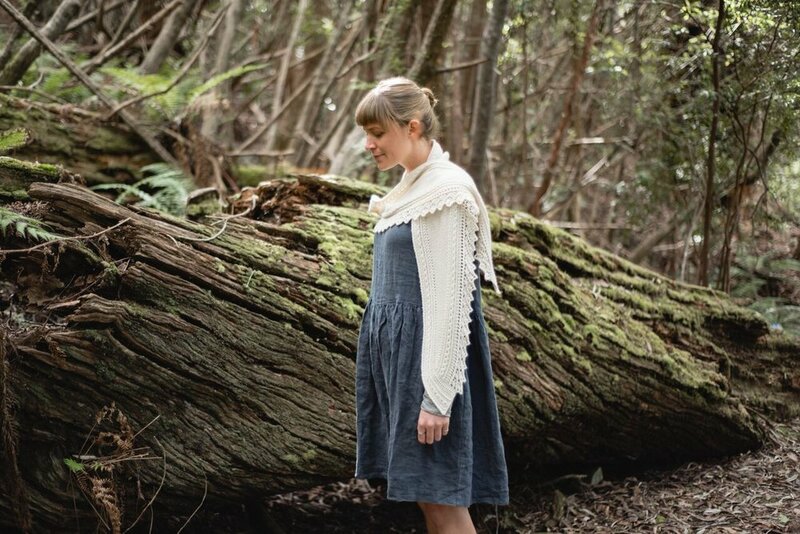 Our sample is in the Fairy Wren colourway, but the boucle is now available in eight colours. And because Boobook Trail is knitted holding two strands together, the colour play possibilities are many. Georgie Nicholson designed Uwland (pronounced “You-land”) with three sizes to suit children and adults alike. We knitted ours in the ‘Wild Orchid’ colourway, but our 8ply range now incorporates seventeen colourways – so many possibilities. 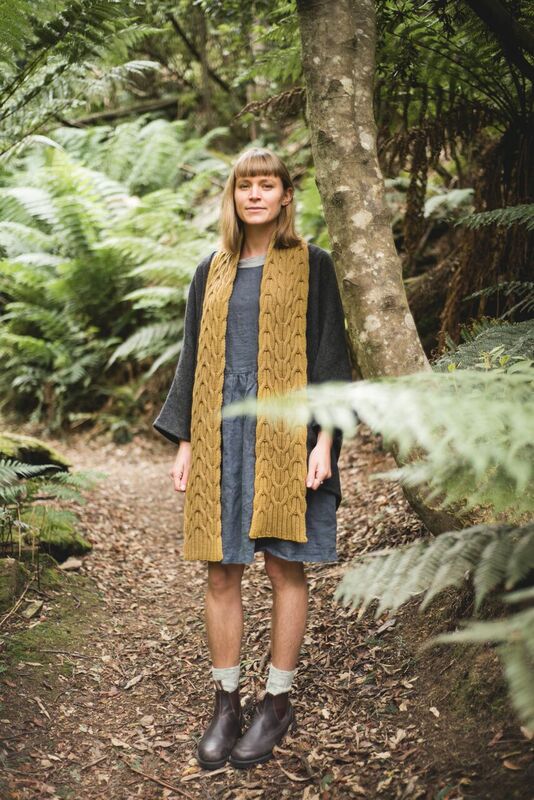 Sandy Holdaway has designed our brand-new scarf pattern. Overleaf is a completely reversible cabled scarf of generous proportions and we absolutely love it. Seen here in our ‘Sedge’ colourway, Overleaf will suit men and women alike. We can see this scarf becoming another modern classic, and look forward to seeing it in more colours! There is a reason shawls have made a comeback in recent years; not only are they fun to knit, they are practical and beautiful to wear. Thornberry by Sally Oakley is an asymmetrical triangle shawl with bands of stocking stitch and garter, and a little lace. Knitted at a loose gauge in our 5ply silk/merino, Thornberry is seen here in the natural and Hawthorn colourways. Oolong, by Georgie Nicholson is a delightful, surprising knit. With an interesting and engaging construction (a bit of a Tikki trademark! ), Oolong is modelled here in the Natural colour of our silk/merino 5ply. A long crescent shape makes Oolong easy to wear. 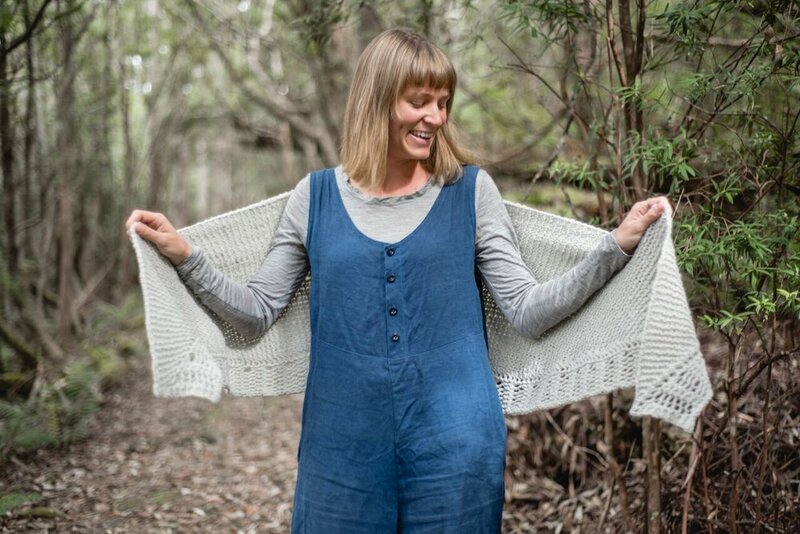 Finally, Kelly Brooker contributes a beauty of a design in the Homely Shawl. We knitted ours in ‘Gum Grey’ boucle, for the ultimate go-with-everything accessory. Large and soft as a cloud, Homely is the cosiest of shawls. Enjoy browsing our Winter Collection! You'll find it here. Remember that you can choose one free pattern with each yarn purchase. Have fun with colour choices, and dream of cosy warmth.